More kiwi, laminated, to decor. 225 gr cream cheese (Philadelphia type). 1 teaspoon sugar extract, or if you don't have any, subtitute for 2 teaspoons lemon juice and its zest. Preheat the oven at 160ºC (325ºF) and prepare a cupcake pan with cupcakes cases. In a bowl, shift the flour and baking power together. In another bowl cream together butter and sugar, then add the eggs, adding the flour & baking powder and the vanilla extract. Mix well. Add half the cubed kiwis to the batter, combining well, don't overmix. Fill the cupcakes cases, not more than 2/3 of them. Make sure the batter is even and then spread the rest of the cubed kiwi on top. Bake for 20-30 minutes, till a toothpick inserted comes out clean. Let cool for 5 minutes in the cupcake pan, and then cool off completely in a rack. Meanwhile prepare the frosting mixing the butter with the icing sugar, beating well and add the cream cheese, add the lemon and mix well (it can be done by hand, though better with an electric mixer). You can use either a piping bag or just spread it with a spoon. 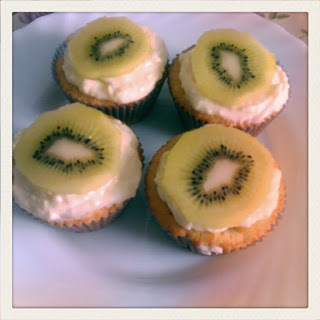 Add a slice of kiwi on top to finish them up.